Here's a small selection of the 32 amplifier projects built by the Fall '17 Lick-Wilmerding Analog and Digital circuits classes. I've been facilitating this project each fall for a few years now and students continue to amaze me with innovative applications of design, material use, and tool application. All of the amplifiers have a class-D amplifier IC circuit at the heart, to which many students added extra features like analog potentiometers, bluetooth connectivity, and audio responsive lights. Amity's log amplifier with audio responsive fire lights. Lucy's phonograph-inspired amplifier with built-in drum machine. 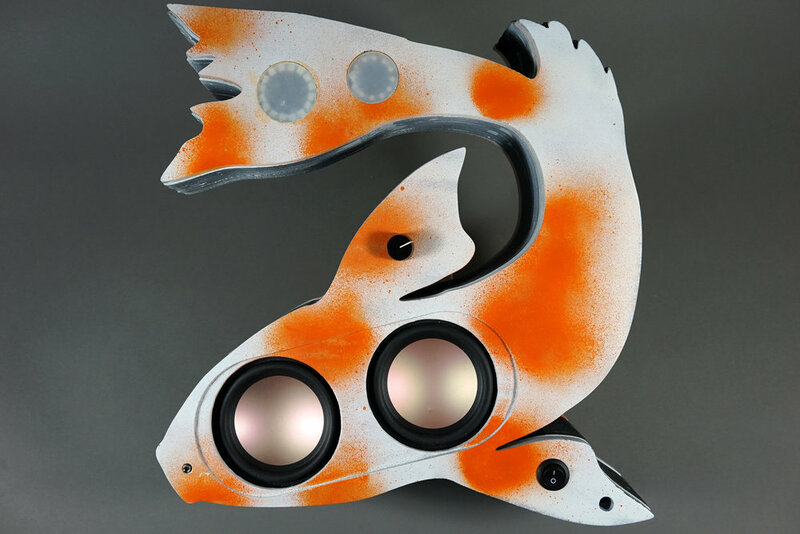 Nevin's koi amplifier with bluetooth and audio-responsive led rings. Samuel's reproduction-radio-turned amplifier with bluetooth and music visualizer. Brittney and Oscar's solid wood amplifiers. Ben W. made his amplifier wearable. Ben G's custom-circuit amplifier in the style of a space capsule. Jasmine's owl amplifier with bluetooth, beak as volume controller and audio-responsive eyes. Here are a just few of the 30+ amplifier projects built by the Fall '16 Lick-Wilmerding Analog and Digital circuits class. Students mixed all kinds of materials and tools from the CNC cutting to 3D printing to found objects. All of the amplifiers use a class-D amplifier IC circuit at the heart, to which many students added extra features like tweeters, analog potentiometers, bluetooth connectivity, and audio responsive lights.